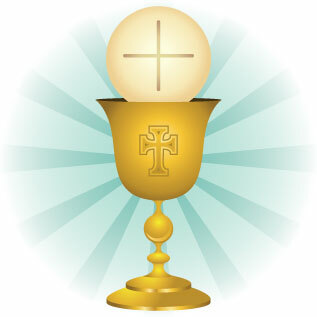 The first time a child receives the Holy Eucharist is a very special day in their life with Jesus. They learn how special it is that Jesus gave everything He had to help us get closer to God. Sacrifice is hard, but God loves us so much. Retreat: Sunday, April 28; Meet in church for 10:00 Mass; we will bring the children to school after Mass; parents return to school to make banners at 1:30 p.m. Dismissal at 2:30. First Holy Communion: Saturday, May 4, 4:00 Mass; bring children to the church hall at 3:30 p.m.
First Holy Communion: Sunday, May 5, 10:00 Mass; bring children to church hall at 9:30 a.m.
May Crowning: Sunday, May 12; 10:00 Mass; bring children to church hall at 9:30 a.m.
For Sunday/Catholic school students: Choose one date; please call us to let us know the date you will attend. Meet at 10:00 Mass. After Mass bring children to the front of the church. We will take them to the school. Parents return at 1:30 to make banners. Children will participate in the procession to crown Mary. Wear your First Communion clothes!